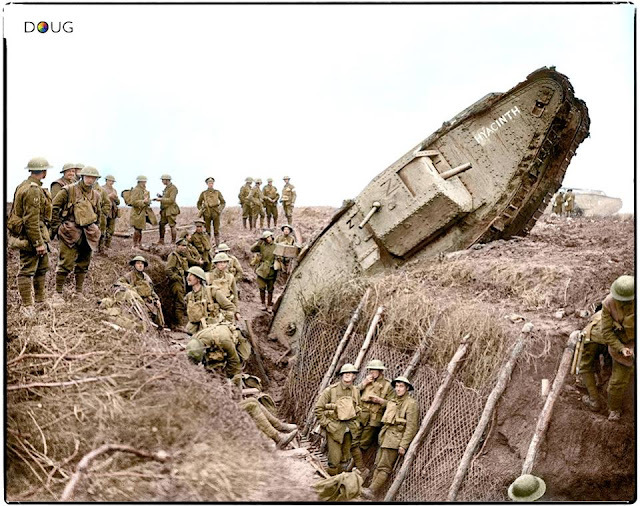 Mk.V tank 9038 of C Coy, 8th Battalion, loaded with wooden bridging material and a specially built contrivance for crossing trenches, stranded in a trench near Cologne Farm, in the Bellicourt section of the Hindenburg Defences, Aisne, Picardie on October 4th. 1918. 9038 was later retrieved and in 1919 was sent to Russia as part of the White Russian Army but captured by the Red Russians on January 1st 1921. 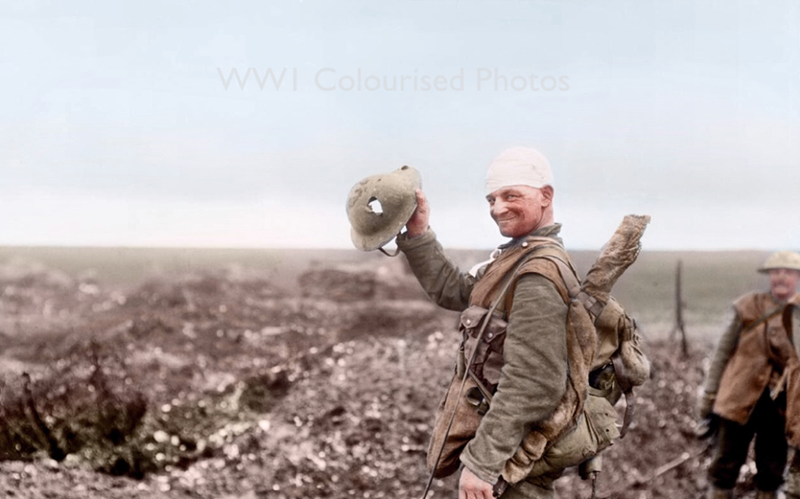 A wounded British soldier showing the shrapnel damage to his steel helmet caused near Beaumont-Hamel, on the Somme Front in December 1916. 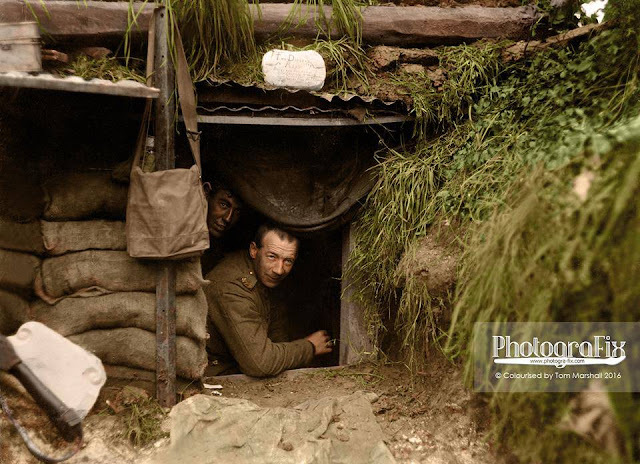 An officer being rescued from a dug-out which has been blown in by shell fire, Mouquet Farm, September 1916. 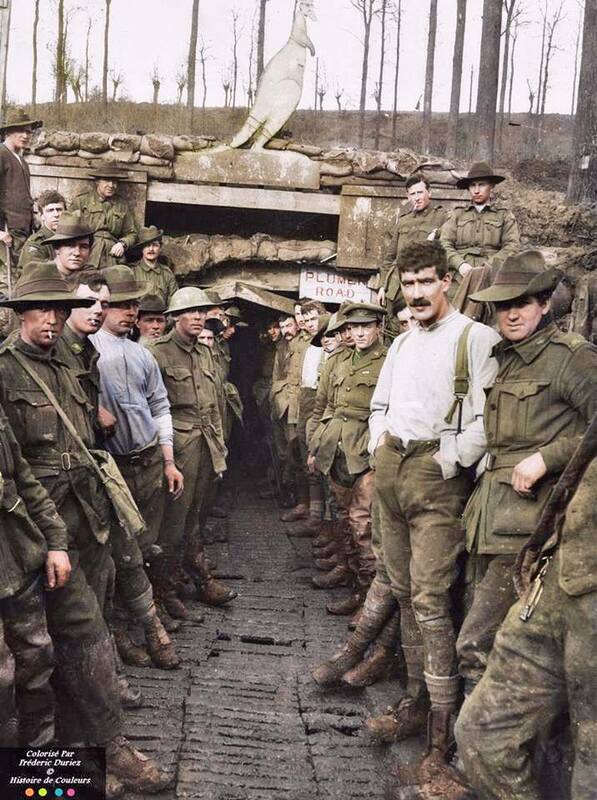 The fighting at Mouquet Farm was the site of nine separate attacks by three Australian divisions between 8 August and 3 September 1916. The farm stood in a dominating position on a ridge that extended north-west from the ruined, and much fought over, village of Pozieres. Although the farm buildings themselves were reduced to rubble, strong stone cellars remained below ground which were incorporated into the German defences. The attacks mounted against Mouquet Farm cost the 1st, 2nd and 4th Australian Divisions over 11,000 casualties, and not one succeeded in capturing and holding it. The British advance eventually bypassed Mouquet Farm leaving it an isolated outpost. It fell, inevitably, on 27 September 1916. Hébuterne and its vicinity are of some significance in the history of New Zealand arms. 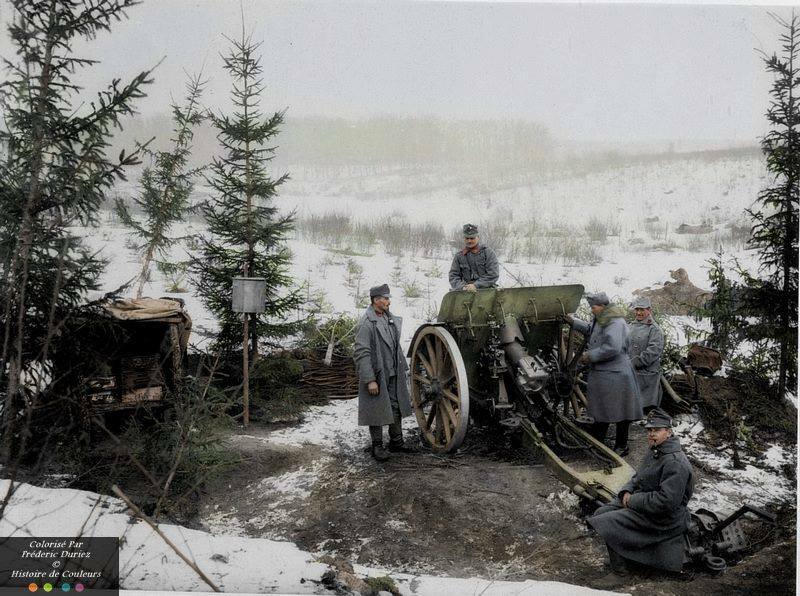 Not only did the division finally arrest the German momentum there in March/April 1918, but it also became the start point of the Advance to Victory of August to November 1918. 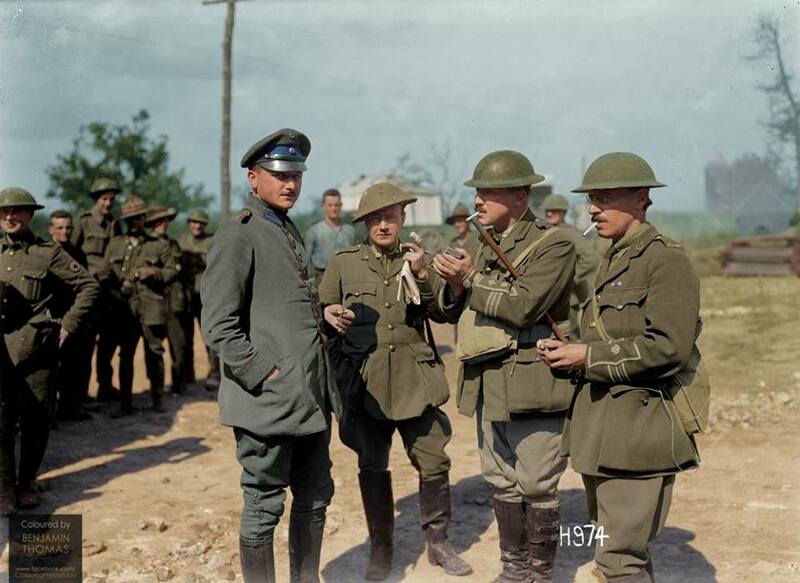 Hébuterne was the place where Sergeant (later Major) Reginald Stanley Judson of the Auckland Regiment won the Distinguished Conduct Medal, to which in the space of a month he would add a Military Medal and then the Victoria Cross at Bapaume. 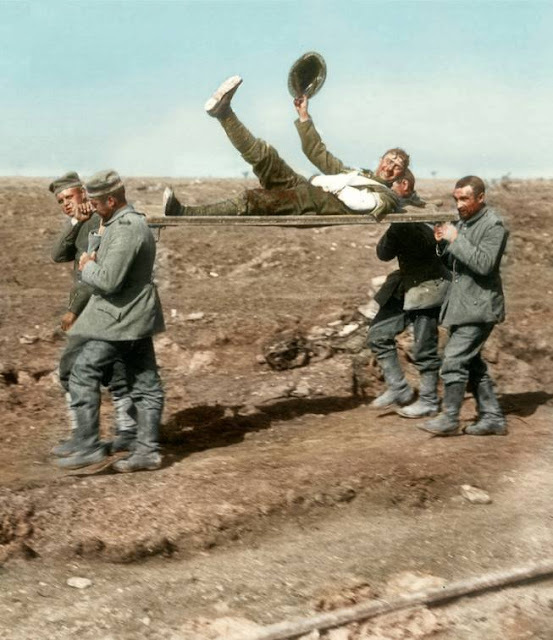 The German medical officer, Lt Schnelling of the 14th Bavarian Regiment, who was detailed to attend to the German wounded and who came to a 3rd New Zealand Field Ambulance station near the front line. Schnelling, left, is pictured with Colonel J. Hardie Neil and Major H. M. Goldstein, M.C. Photograph taken near Bapaume, France, 27 August 1918. 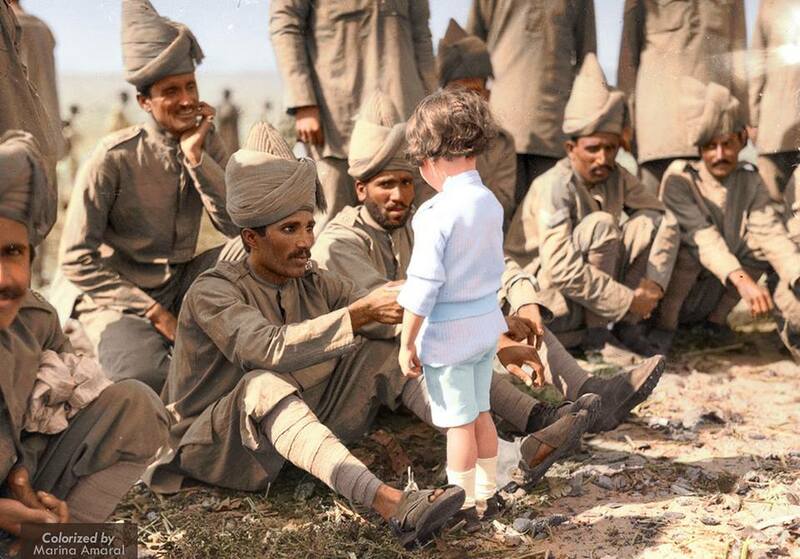 A French boy introduces himself to Indian soldiers who had just arrived in France to fight alongside French and British forces, Marseilles, 30th September 1914. Battle of Flers-Courcelette. A stretcher borne wounded soldier waves his helmet (and leg) as he is carried in by German prisoners. 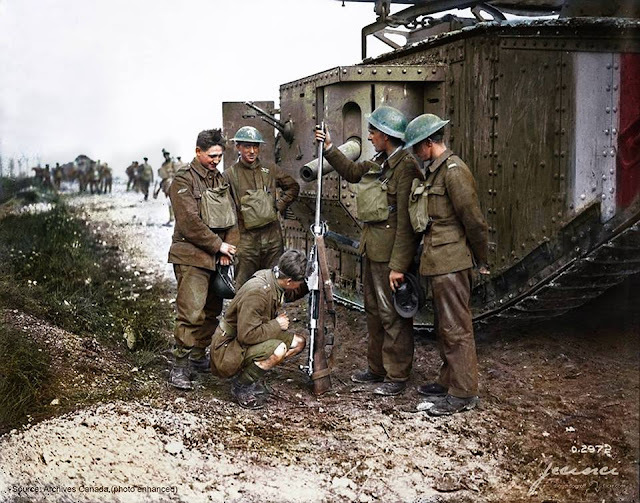 Near Ginchy, 15th September 1916. 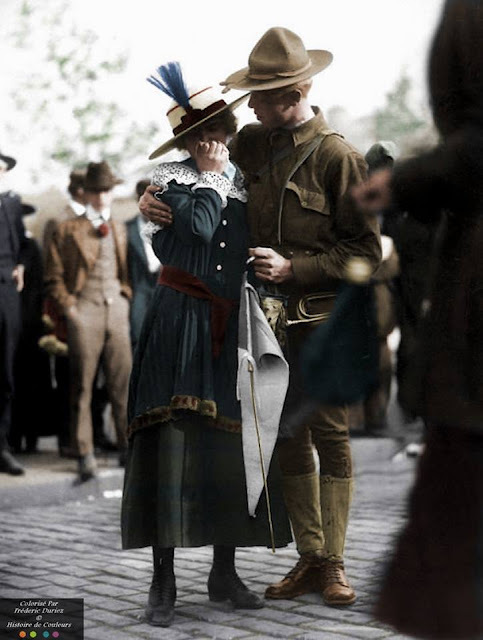 A soldier of the 71st Regiment Infantry, New York National Guard, says goodbye to his sweetheart as his regiment leaves for Camp Wadsworth, Spartanburg, South Carolina, where the Division is set to train for service, 1917. For this photo someone called W.Acott 6th Queen’s Own Royal West Kent Regiment says the man on the left is stretcher bearer Jimmie Nye, later killed in action”. British infantrymen give a helping hand to wounded German prisoners near La Boisselle on 3 July 1916. They are both wearing their equipment in ‘fighting order’. One has an additional bandolier of ammunition, and each has an anti-gas PH (phenate hexamine) mask in a small bag hung at the front. 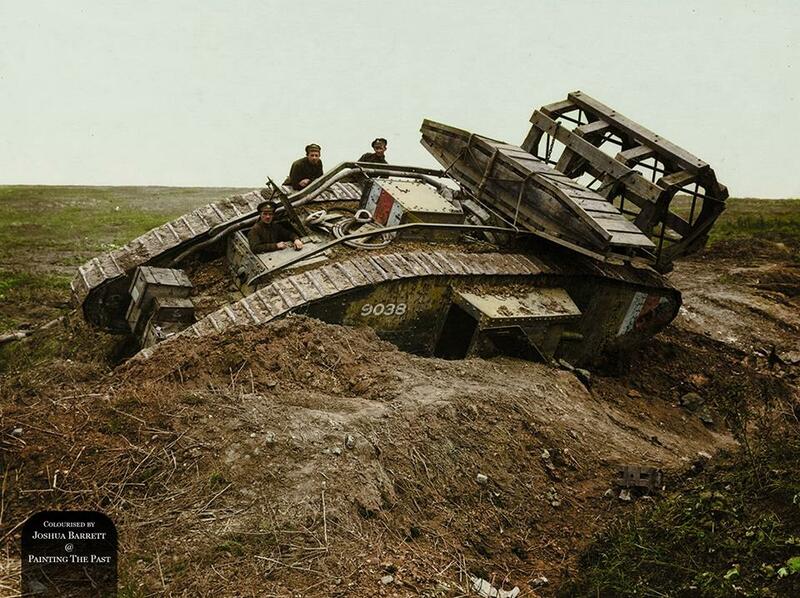 A first day objective, La Boisselle fell on 4 July. The 6th moved to Baizieux on the 30th June and went into the reserve at Hencourt and Millencourt by mid morning on the 1st of July. They relieved the 8th Division at Ovillers-la-Boisselle that night and attacked at 3.15 the following morning with mixed success. On the 7th they attacked again and despite suffering heavy casualties in the area of Mash Valley, they succeeded in capturing and holding the first and second lines close to Ovillers. They were withdrawn to Contay on the 9th July. A Mark IV (Male) tank H45 ‘Hyacinth’ of H Battalion ditched in a German trench while supporting the 1st Battalion, Leicestershire Regiment, one mile west of Ribecourt. 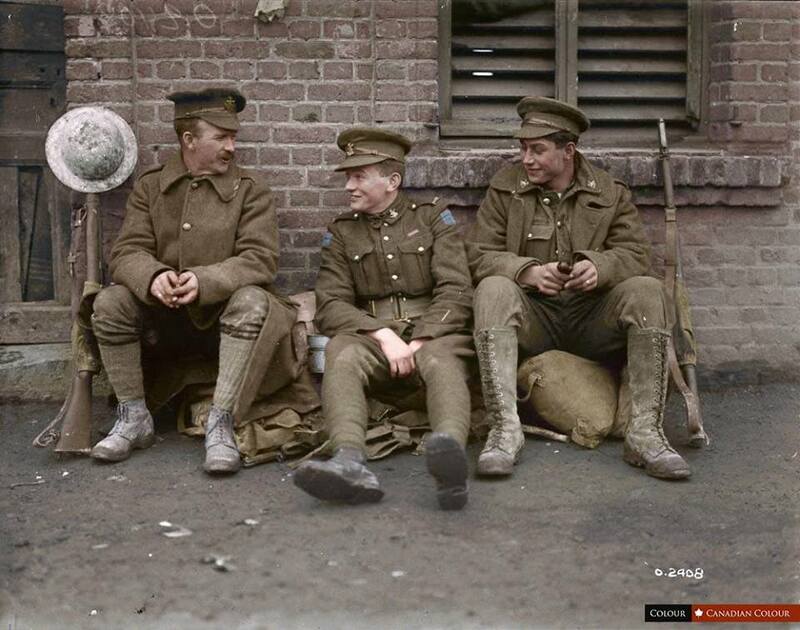 Some men of the battalion are resting in the trench, 20 November 1917. Commanded by 2nd Lt. Jackson, H Btn, 24 Coy, 10 Sec. During the attack it reached the first objective of the day, The Hindenburg Line, before falling in the ditch. A Sentry of the 1/4th Battalion, East Lancashire Regiment in a sap-head at Givenchy-lès-la-Bassée, Pas-de-Calais, France, 28 January 1918. 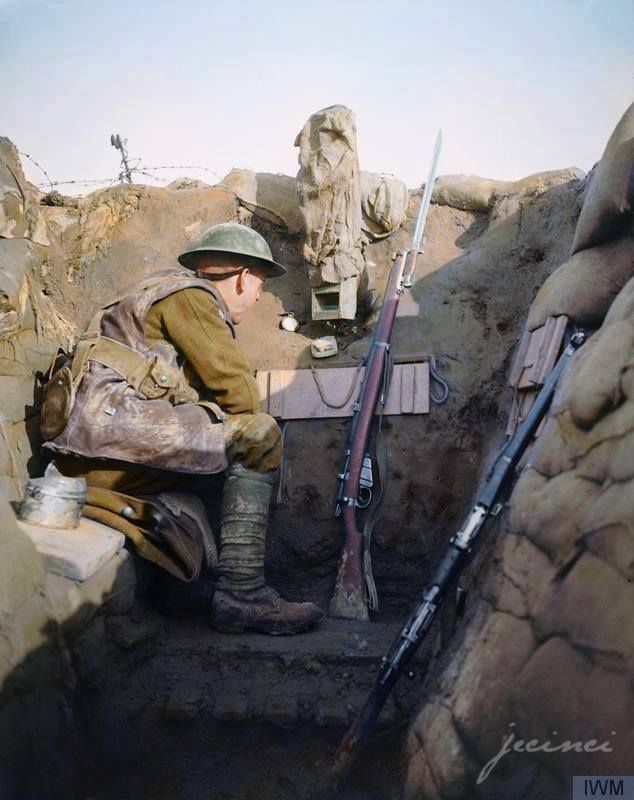 A ‘Listening Post’ also commonly referred to as a ‘sap-head’, was a shallow, narrow, often disguised position somewhat in advance of the front trench line – that is, in No Man’s Land. 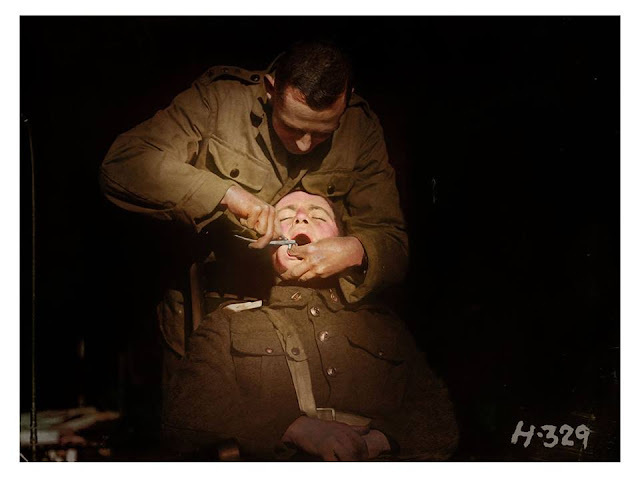 A New Zealand soldier undergoing a dental extraction at the New Zealand Dental Corps hospital in Nielles-lès-Bléquin, France, during the First World War. November 1917. In the early stages of the war, between a quarter to a third of recruits were rejected for service on account of dental defects. The New Zealand Dental Association, seeing an opportunity to raise their profile, took up the challenge to treat these men and contribute to the war effort. They lobbied the Defence Force to create the first ever Dental Corps in November 1915, with the aim to have every soldier of the Expeditionary Force dentally fit for service. This was by no means an easy feat. Dental officers inspected the teeth of prospective soldiers in New Zealand mobilisation camps, and accompanied troops when they were mobilised overseas. 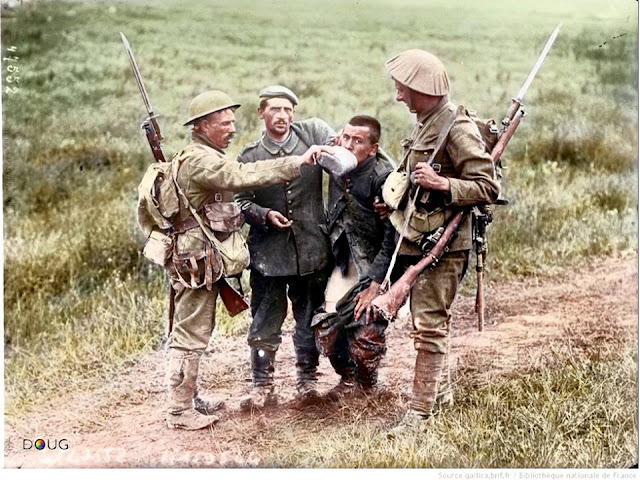 If the Army’s policy was to send a reinforcement of approximately two thousand healthy men each month, the work of the New Zealand Dental Corps (NZDC) was not to be underestimated. Between 1915 and 1918, they performed 221,214 filling operations and 98,817 teeth extractions. The NZDC earned a reputation for mobility and efficiency. A dental hospital was set up only 5 kilometres from the front line on the Somme in September 1916. From ‘moral tooth brush drills’ at the camps to fillings, extractions and the treatment of the prevalent gum disease, ‘trench mouth’, the Dental Corps is thought to have saved the State around £19,000 per year. 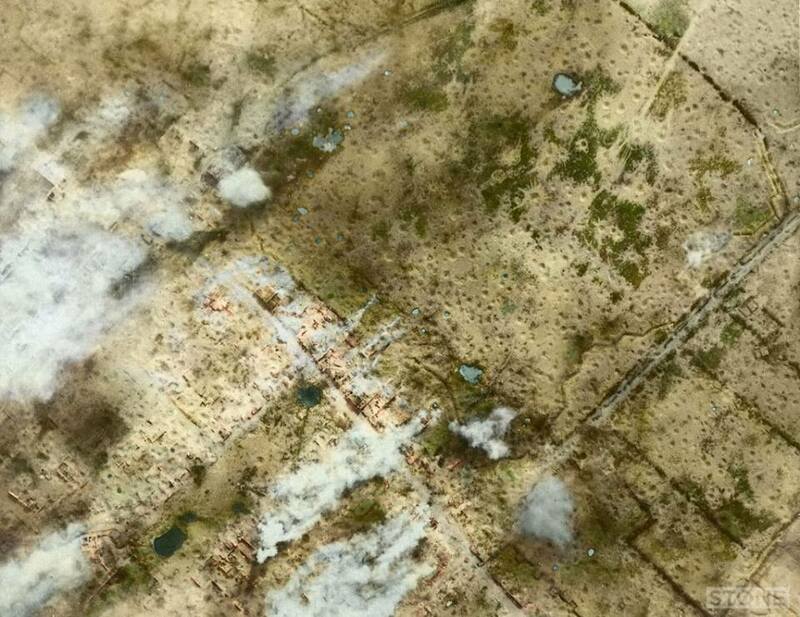 This is an aerial photograph of Messines, just to the South East of Ypres, this was taken on the 2nd of June 1917, just prior to the Mining attack, but presumably during the bombardment judging by the plumes of smoke. “…..you can see the scale of it, I realised as I worked on it you can see planks and joists as well as piles of brick rubble in quite a lot of detail, it becomes almost like a video game image, like some morsel of video intrigue from the 1990s, ‘Close Combat’, with it’s crawling terrified and tired men. There I suspect is one of the main problems we have in industrialised warfare, that game image and the fact that there’s real people in it down there somewhere too small to see while you’re pouring shells onto them or bombing them or now of course using missiles and drones. Ploegsteert Wood, 22nd January 1918. 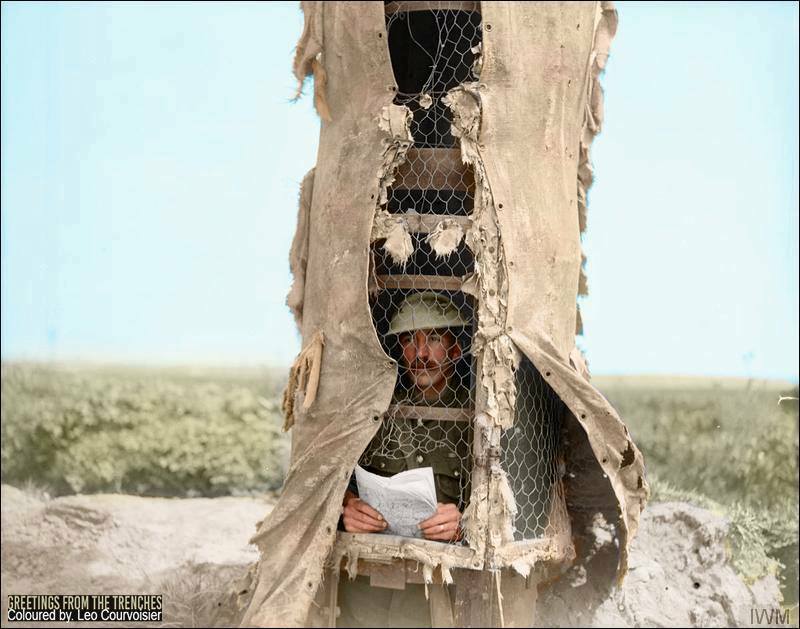 A New Zealand Officer sits at the entrance of a dug-out in the Front Line, reading a newspaper. 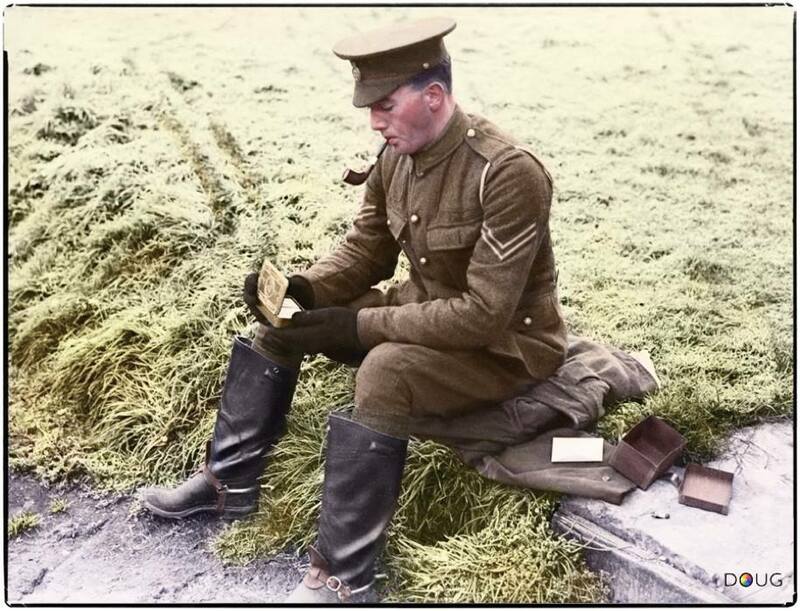 Near Messines, Belgium May 15 1917. A Mauser T-Gewehr – German anti-tank rifle, being admired by some Canadian soldiers and the crew of a RTC Mk.V tank during the Battle of Amiens. Prosit Neujahr’ Happy New Year. 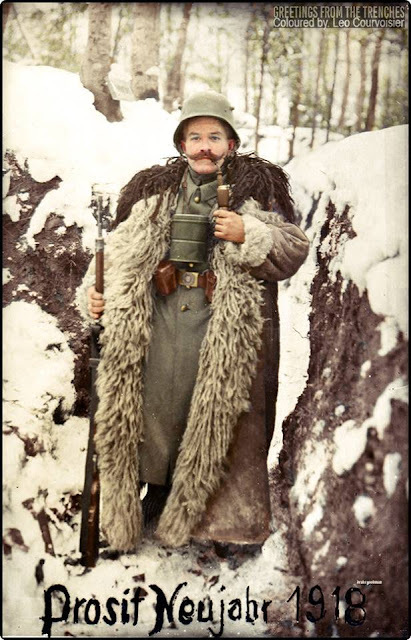 A German sentry welcomes in the new year – 1918. 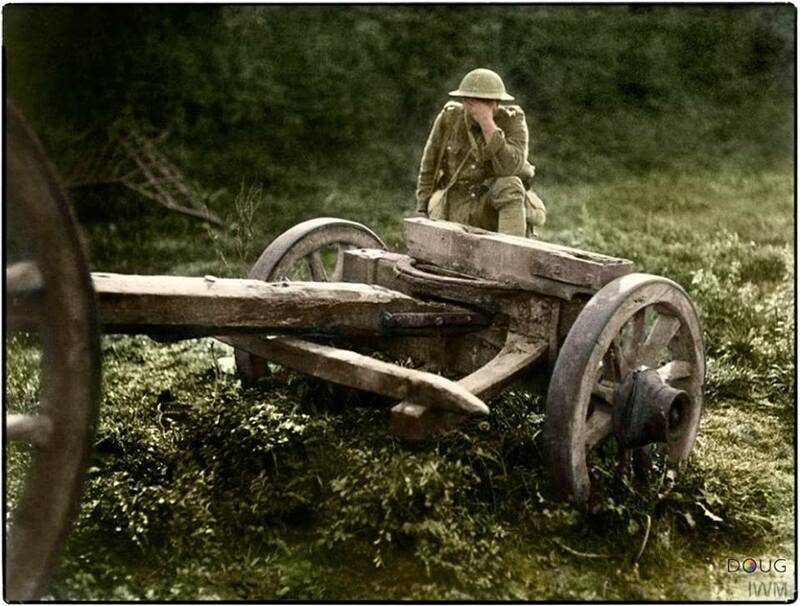 A British soldier resting near Aveluy Wood, just outside the town of Albert on the Somme. Carrier pigeons were used extensively during the First World War to relay messages over distances at relative speed and astonishing reliability. Man-made communication devices were still largely un-reliable and crude at the time and as a result the duty of delivering news was pasted down to message runners, dogs and pigeons. Pigeons excelled were runners could not. 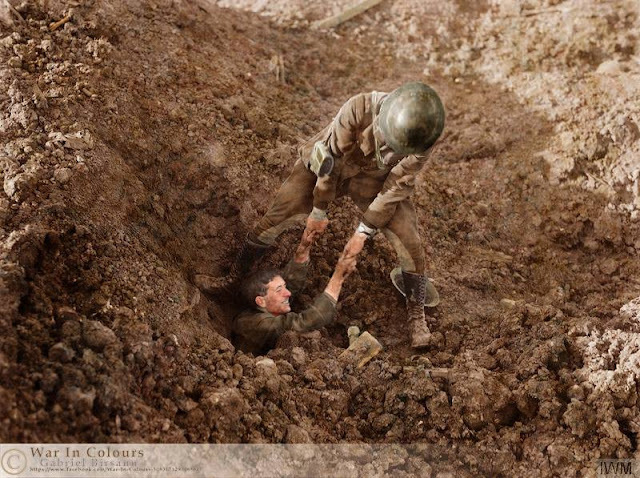 The job of a runner during the First World War was exceptionally dangerous as it required the soldier to leave his cover and run, often completely exposed to the enemy lines, between trenches. The fatality rates of runners were extremely high and there was little guarantee of messages reaching their intended destinations or knowing if they had if they did. The small size of pigeons combined with their fast speed made them almost impossible for marksmen to shoot out of the sky, as a result birds of prey were often fielded by the enemy forces who let nature play out between the two. 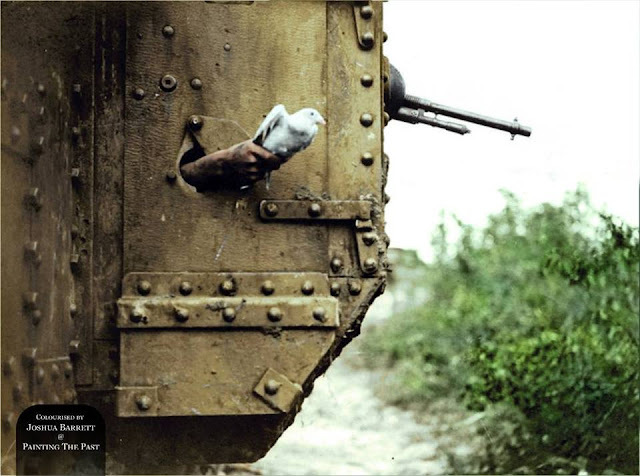 After the introduction of tanks in the First World War, crews were equipped with a number of carrier pigeons as a means of keeping in touch with the outside world and relaying their position to friendly forces. Albatros D.V prototype with ‘lozenge’ camouflage. 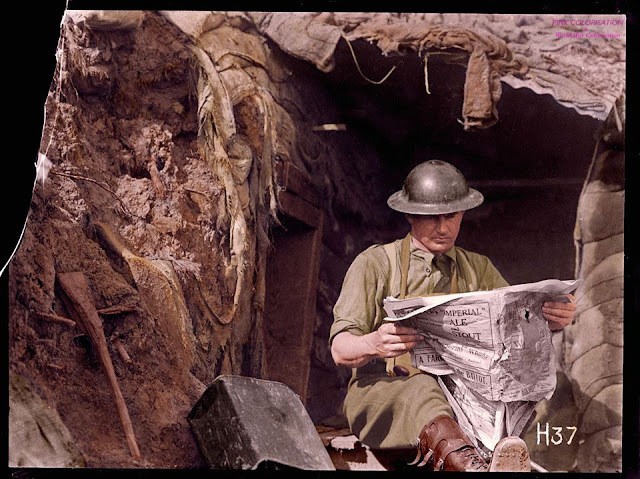 April 1917. The Albatros D.V was a fighter aircraft used by the Luftstreitkräfte (Imperial German Air Service) during World War I. The D.V was the final development of the Albatros D.I family, and the last Albatros fighter to see operational service. Despite its well-known shortcomings and general obsolescence, approximately 900 D.V and 1,612 D.Va aircraft were built before production halted in early 1918. The D.Va continued in operational service until the end of the war. In April 1917, Albatros received an order from the Idflieg (Inspektion der Fliegertruppen) for an improved version of the D.III. The prototype flew later that month. The resulting D.V closely resembled the D.III and used the same 127 kW (170 hp) Mercedes D.IIIa engine. The most notable difference was a new fuselage which was 32 kg (70 lb) lighter than that of the D.III. The elliptical cross-section required an additional longeron on each side of the fuselage. The prototype D.V retained the standard rudder of the Johannisthal-built D.III, but production examples used the enlarged rudder featured on D.IIIs built by Ostdeutsche Albatros Werke (OAW). The D.V also featured a larger spinner and ventral fin. The back of a canvas and steel tree observation post, near Souchez, Pas-de-Calais, France. 15 May 1918. Trying to hide yourself in No Man’s Land during the war was a risky business. The badly damaged landscape gave no real cover from the watching eyes on either side. Therefore, the ability to spy on the opposite trenches whilst remaining hidden was highly valuable. To achieve this, both sides began to develop Observation Post Trees (O. P. Trees) made of iron, canvass and sheet metal. Designed to replicate the shell splintered trees that existed in No Man’s Land, these observation posts were originally constructed behind the lines. Then, once they were nearing completion, during the darkest nights engineers would cut down or remove existing trees and replace them with the false one. From these fake trees observers and snipers were now able to watch the enemy whilst effectively hiding in plain sight. The British Army used around 45 Observation Post Trees during the conflict with the first being placed near Ypres. It was during the investiture at Buckingham Palace that Holmes admitted to King George V that he had lied about his age and joined the army at age 17. Sergeant Tommy Holmes, VC, returned to Owen Sound after the war to great fanfare and receiving a hero’s welcome. On 16 September 1919, he was chosen to be part of the Colour Party for the laying-up of the 147th (Grey) Battalion, CEF Colours in the Carnegie Library, Owen Sound. 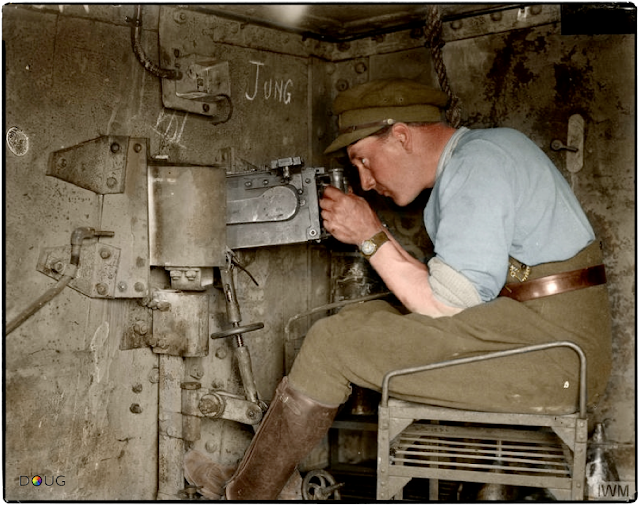 105mm M14 lFH Skoda Feldhaubitzenbatterie 3/55 c.1917. 105mm M14 lFH Skoda – was the standard Light Field Howitzer of the Austria-Hungarian Army and was also used by Germany.